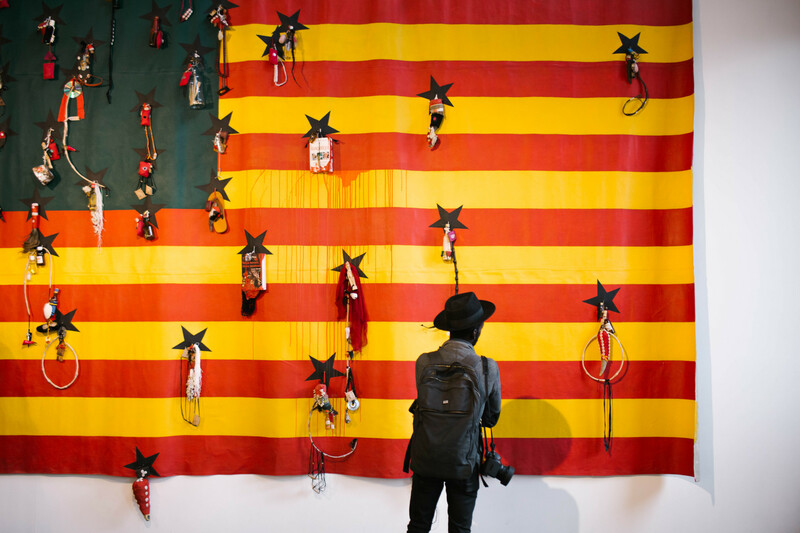 Presenting Etats Désunis d’Afrique!/Criblés as part of 1-54 Special Projects, artist Nú Barreto explores the universality of poverty, violence and corruption focused on the socio-political landscape of the African continent. 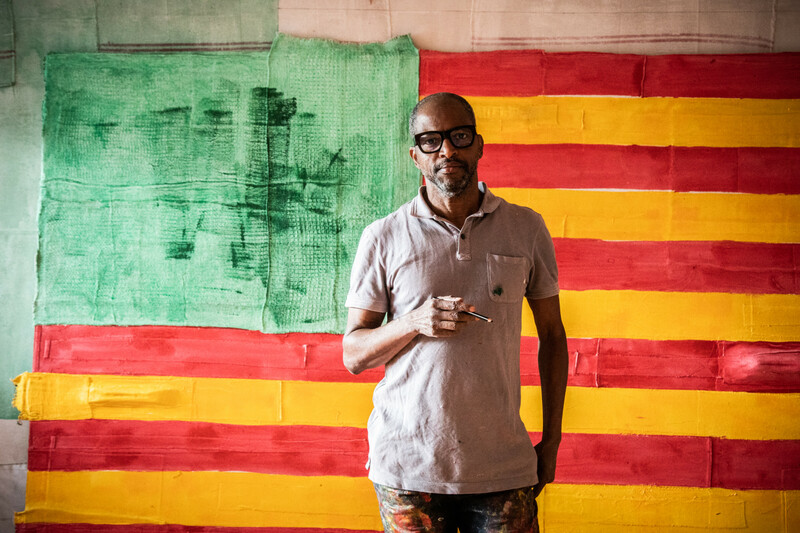 His work is a revision of the American flag, with a pan-African colour palette embedded with symbolism and cultural/historical references. In interview with 1-54, Barreto delves into his practice and creative approach. Read more about Etats Désunis d’Afrique!/Criblés here, Special Project part of the 6th London edition of 1-54 presented by Galerie Nathalie Obadia, Paris / Brussels. Can you talk to us about the special project you are preparing at this year’s 1-54 London edition? Etats Désunis d’Afrique/Disunited States of Africa is a project that I started in 2009 and took shape over the years. The notion of division has always been a major theme in my artistic practice. To me, division is the one way to prohibit society’s progress. In occasion of this year’s 1-54 London edition, I was commissioned another version of the EDA/DSA project entitled Criblés(supported by Galerie Nathalie Obadia). This work is a strong and explicit condemnation of known conflicts and fratricides’ wars. I used various cartridge cases as a warning and to denounce what is now irreparable and interminable. It is an ambitious project with a deep hope that politics could eventually fix social issues, and that social issues can restore consciousness in politics. Your work is highly influenced by Africa’s political and social issues. Being based in Paris, how do you stay in touch and engage with the continent’s current affairs? I have the privilege of being able to travel to Africa every year. Despite the socio-cultural differences that divide many African countries – either the North from the South or the East from the West – my feeling of seeing it as only one country doesn’t change. They all have their own realities, but they are very similar – that’s shortage in abundance. I also keep myself updated online, I think that keeping informed is a duty for anyone who wants to defend his or her country, whatever weapon they use. Do the techniques you use influence the ideas you want to represent or are the ideas influenced by the technique? In my practice, technique helps me to define and play with ideas. Ideas are at the base of my approach, which then I execute striving for perfection. To me, there must to be a balance between the conception and the execution of the work: it’s an inseparable process that all creators should achieve. Does the context of an art fair provide a different perspective for your practice? For artists, art fairs are an occasion to discover other artists and broaden your horizons, getting to know what’s being done somewhere else. Also, a fair it’s a place to meet new people and create connections, it’s an enlightening place and I try to make the best of it. My work and research will always focus on society and I hope to show more at fairs, which have now become inescapable events. You have presented part of these series at the fair before, at 1-54 New York 2017. How did the American audience react to it in terms of the similarities in the visual and cultural language with the country’s history of colonisation and war? 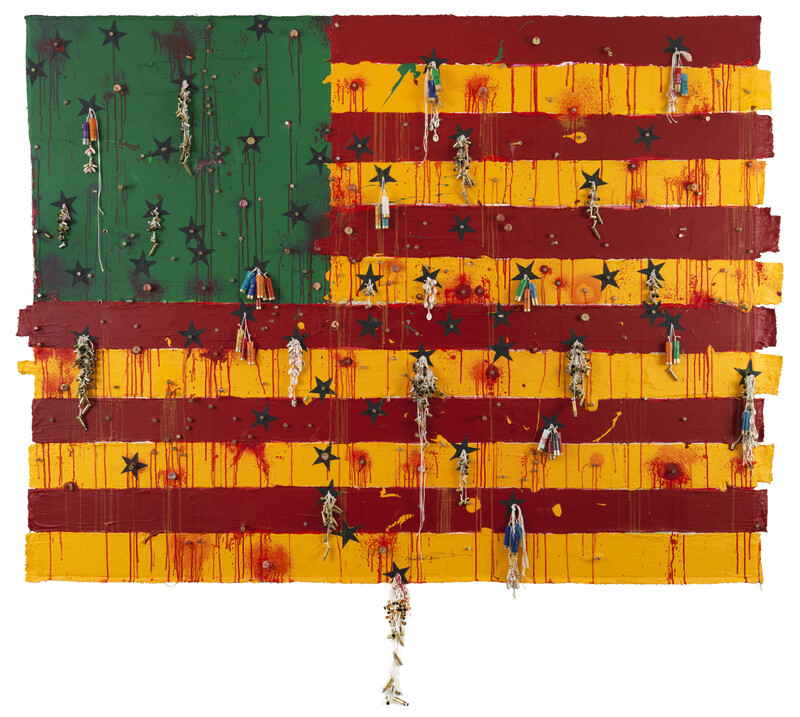 The first work of the series (Etats Désunis d’Afrique/Disunited States of Africa) was shown at 1-54 New York in 2017. It was an immediate success that aroused lots of visitor’s curiosity. They wanted to know more about this flag that reminded them of the American one. Many people expressed a positive outlook on the issues occupying the African continent, despite the distance separating America from Africa. It’s also interesting how the histories of Africa’s colonisation, occupation and slavery become present in the USA. On the first day, a little girl asked me why I changed the colours of the American flag and the day after, an elderly man told me “you did a really good representation of the American flag!” and tried to strongly convince me that the American flag should be drawn differently this way; in his opinion, its inequality caused disunity between colours and shapes. I am deeply persuaded that the existence of 1-54 will eventually contribute to correct the gaps and give a different perspective on this far away, yet very near, continent. The American public still needs time to better accept and understand this history, which they will be eternally related to.